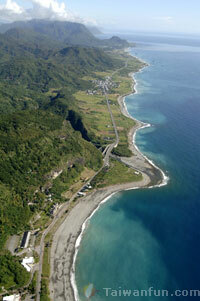 The Taitung coast stretches for 176 kilometers and includes pebble, precipice and reef shorelines. Whether surrounded by razor-sharp rocks and steep hills, or tucked inside winding bays and capes, the coasts of Taitung are daily bombarded with large waves from the Pacific Ocean, especially near the Basian Cave. Slow erosion is common along the coast, especially a bit north of Beinan Creek, where all kinds of chimerical land formations can be seen. Here, stones are scattered on the shore along sea trenches and tide pools. Places like Shiauyeliou, Sansiantai, Shihyusan and Wushihbi are virtually "stone sculpture" areas, where nature looks like it was created at the hands of an artist instead of the elements. In addition, Jinzun, Changbin Bay, and Shanyuan Swimming Beach are the perfect places for walking along the pebbled shore. Located in Donghe is the Jinzun Recreation Area, which has a lot of romantic scenery that would be very nice for a first date or an afternoon stroll with a sweetheart. 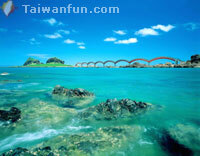 Because this part of the island resembles a drinking vessel, it is named "Jinzun", which means "golden cup". The beauty of Jinzun has been formed by nature, a three-kilometer sand beach, with a 30-50 meter-tall cliff standing high behind it. 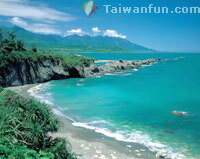 Jinzun island is the only one of its kind in Taiwan, as it gradually joins the main island. It resemble the shape of an anchor, so people also call it "Anchor Island". Yiwan Bay in Chenggong Township is another serene and scenic spot. Nearby Shihyusan (Stone Umbrella), is a well-known rock formation hidden within some rocky cliffs. Due to serious erosion, the "umbrella" has only a very thin handle for support, making it look like it may collapse at any time. The area known as Sansiantai was formed with a combination of outlying islands and a coral reef shore and its man-made bridge has a unique appearance. A walking trail is perfectly planned for those who would like to take a stroll through the caves and small cliffs here. 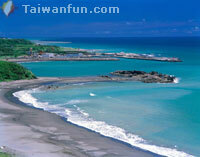 In this way, you can experience first-hand enjoyment of the beautiful coast that Taitung has to offer.